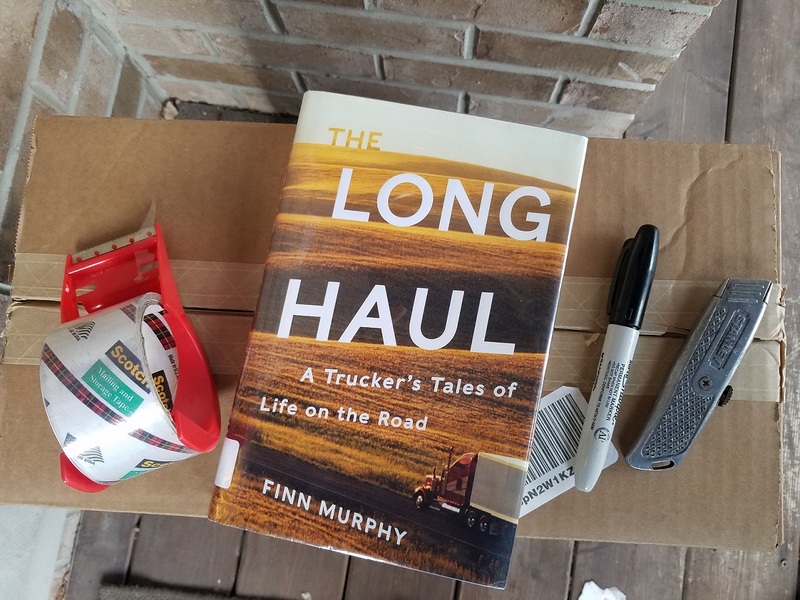 In Finn Murphy’s, The Long Haul: A Trucker’s Tales of Life on the Road, “shippers” get a behind-the-scenes look at what movers really do with your stuff. It’s not always pretty. The bottom line is this: If you want to have a happy move, be nice to the movers. We’re all in this together. Murphy became a long-haul trucker over 30 years ago, handling more than three thousand moves. His perspective on what it’s like from the mover’s side would encourage anyone moving to be a kinder person. Readers learn about the good, the bad, and the ugly of moving from someone who has seen it all. As I read about Murphy’s experience, the copious amount of drinking and driving that occurred back in the pre-union days surprised me. “As far as I could tell,” Murphy says, “the moving business floated on an ocean of alcohol” (13). Fortunately, Murphy claims that things are different now and that the drunk driving of the olden days has disappeared. So, if the last time you used movers was back in the ‘80s and it didn’t go so well, you might want to give it another shot. You might want to pack your own intimate apparel. According to Murphy, movers do not steal from shippers – ever. Murphy assures readers that after thirty years of working as a mover, “I never once saw anyone steal anything from a shipper” (21). Before you get too comfortable, though, you may want to reconsider letting the movers pack your socks and underwear. While Murphy admits that movers don’t steal, a sneak peek at your intimate apparel sounds like fair game: “This is not to say that we didn’t open drawers or boxes, particularly if the shipper was good-looking. Then she could reasonably expect her dresser drawers to be ransacked for a look at the lingerie . . .” (21). Um, okay. Good to know. Murphy airs the dirty laundry of the moving industry, but he’s quick to point out that we shippers aren’t saints either. Murphy claims that movers know more about us in thirty minutes than our friends of thirty years know about us. Movers know more about you in thirty minutes than your closest friends do. A lack of common courtesy can lead to some problems. Yes, us shippers are tired and stressed on moving day, but consider what your mover is going through, too. Your mover is working twelve hour days packing and unpacking people non-stop across the country with little sleep, and he eats when the work is done. The mover doesn’t know what’s waiting for him when he knocks on your door on moving day. Will he get a good shipper or a bad shipper? To ensure that you have the happiest move possible, be the good shipper. Smile, say “hello”, and introduce yourself and your family. Ask for the movers’ names and write them down so you don’t forget them. Offer the movers coffee or a beverage when they arrive. Designate a bathroom in your home that the movers can use. If you’re ordering pizza, order extra for the movers. A tip at the end of the day is appreciated, but not required. Be empathetic to late arrivals – you have no idea the distances or driving conditions under which your mover drove to get to your home. If the movers break, damage or scratch something, imagine your best friend did it – the mover did not do it on purpose. Mistakes happen. Stay calm and it will be handled. If you’re buying donuts, get some extra for the movers. Treat the movers with disrespect. Be rude. When you get an estimate, don’t show the movers everything they need to pack and ship. Movers don’t covet your things. To them, it’s just freight. We have too much stuff. Declutter. In the end, whether it’s in our lifetime or the next generation, all stuff will get thrown out. When passing a truck on the highway, never stay by the front wheels. Pass the truck quickly and get ahead of it. A front-wheel blowout is a trucker’s biggest fear. If you’re moving to Florida, don’t bother taking your stuff down there. Everyone ends up leaving it in the garage or getting rid of it because it doesn’t fit with their new lifestyle. Veteran movers don’t wear jeans. Jumpsuits are much better because they don’t have rivets or require belts that can cause damage on furniture. They’re also looser and more comfortable than jeans. The best map? The Rand McNally Motor Carriers’ Road Atlas. Much better than GPS. If you’re one of the rude shippers, movers will find a creative way to retaliate. Be kind. You don’t know what your mover just went through to get to your place. The most important takeaway from The Long Haul is that possessions don’t matter nearly as much as people do. Accidents and delays happen when you move. Forming a good relationship with your movers will help everything run more smoothly. Murphy, Finn. The Long Haul: A Trucker’s Tale of Life on the Road. (New York: W. W. Norton & Co.), 2017. Good tips to make the movers happy. After all they will be handling all your stuff. Pretty amazing post, very well informed. Thanks for sharing. “Drawers to be ransacked for a look at the lingerie” I laughed way to hard at that. This always scares me, not knowing what they are really gonna do with your stuff.